The mid-segment luxury SUV packs in pretty much everything that you would expect from a luxury SUV, and the M Sport edition will thoroughly please performance enthusiasts, too. Taking the BMW X3 out for a drive, you get the feeling of being cocooned in a shell of comfort. The ride is well sheltered from the usual chaos outside, which is what most luxury buyers would expect. However, the car retains your connection with the ground when you step in behind the steering wheel, in ways that are quite unique to such burly SUVs. Powered by a 3.0-litre, 6-cylinder diesel engine that produces 258 horses of power and 560Nm of torque to go with, the M Sport edition enhances the driving prowess of the BMW X3. It also brings along a host of in-car technology along the way, which makes this a pretty comprehensive package. 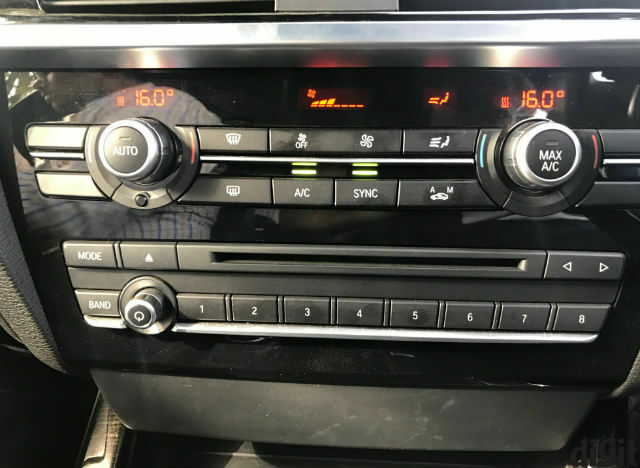 The iDrive infotainment system in the BMW X3 is still the non-touch variant, with a vertically stacked interface on the colour 10.2-inch LED display that is operated by the iDrive controller placed on the central console, beside the gear knob. You do not really miss out on touch input here, and that is majorly because of how easy the iDrive controller is to use. The central hub of the infotainment system is the circular iDrive dial, which can be used to scroll through options, and also acts as a multi-way button and selector. The central area of the dial is a touchpad, which the iDrive software uses to recognise handwriting. 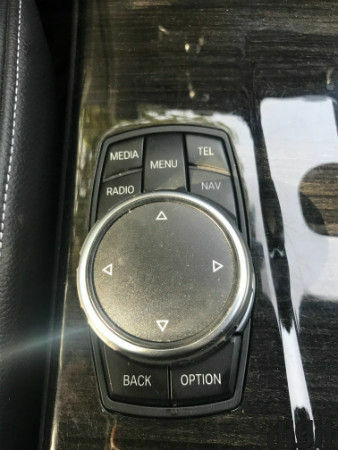 Alongside the central dial, you get a total of seven buttons - menu, multimedia, radio, telephone, navigation, back and options. The menu button will take you back to the home screen from whichever option you are presently on, and the options button gives access to settings. 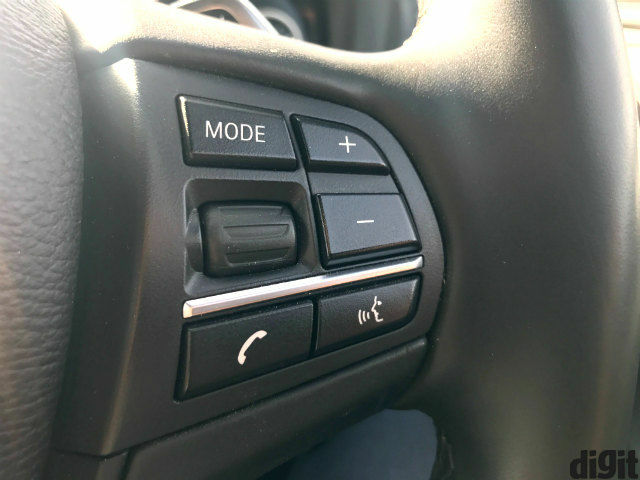 Button feedback is solid and firm, and the buttons themselves do not have a plasticky surface, which makes them feel more in place in the premium interiors. 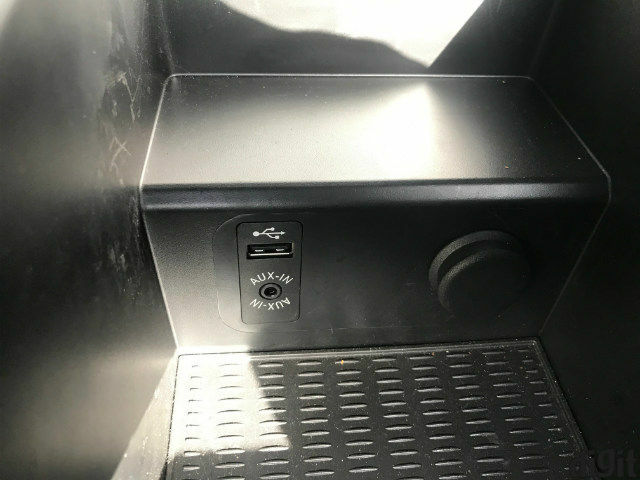 Input options for multimedia include Bluetooth, SD card, USB, aux, local storage and CD/DVD drives, covering every way you can possibly play music with. 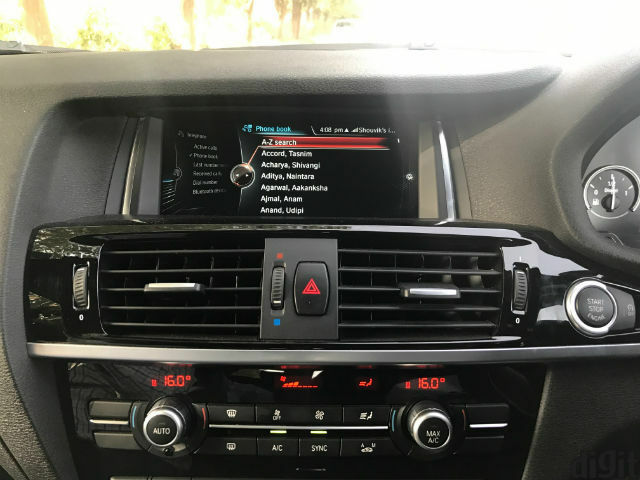 The iDrive system in this variant of the BMW X3 has an integrated hard drive that stores the 3D maps and local music files, which can then be rated on the music interface to indicate listening preference and arrange into playlists. Wireless connections are easy to establish from the Connections tab in Settings, and you can pair up to five devices simultaneously, with two devices in active connection with the system. What makes connectivity really versatile here is that, even after two devices connected via Bluetooth, you can connect more sources via USB, memory cards and DVD drives, all of which are hot swappable. Phone services activate only when you pair via Bluetooth and allow contact and media access from the iDrive prompt. Hence, if you would need to charge your smartphone while driving and simultaneously need to talk on the phone, activating handsfree would need you to pair your phone via Bluetooth, select your device as a Bluetooth device on iDrive and connect it for USB charging. The circular alphanumeric input system is dynamic, decreasing alphabet options to ease selecting letters when you are searching for a contact, or entering destinations on the sat-nav. Telephone controls include recent call lists, contacts and a number pad, and you can access them on the display via the iDrive controller, voice input, and steering-mounted telephone button that prompts telephone options on the head-up display (HUD), or on the multifunction display (MFD) in the instrument cluster when HUD is switched off. Other features of the iDrive infotainment setup include a 3D navigation system with preloaded maps, which program routes quite fast. Zoom in/out is done via the iDrive controller, and I somehow prefer this to pinching on non-responsive touchscreens. Every option - from inserting directions, changing routes, seeing nearby points of interests, loading addresses from contacts and changing map views can be controlled from the map interface itself. The background of the infotainment system matches ambience with the dominant colour on the display, which is another nice touch to the system. You can also get a splitscreen view, which I find particularly helpful. Personally, I prefer keeping the map view active while driving, and the splitscreen view helps to switch intermittently to the music player or radio to change tracks. Tapping the iDrive controller left/right switches between the two screens on the display, which again is very easy to use. You get access to BMW’s 24x7 roadside assistance, along with ConnectedDrive services that lets you load BMW apps, including Spotify, Facebook, Twitter, Wiki Tourguide and more. The apps are useful depending on whether you’d really want to use them on your journey. If you are in a new city, the Wiki Tourguide can be pretty useful, and having a semi-colour Facebook timeline to check occasionally does not hurt, either. 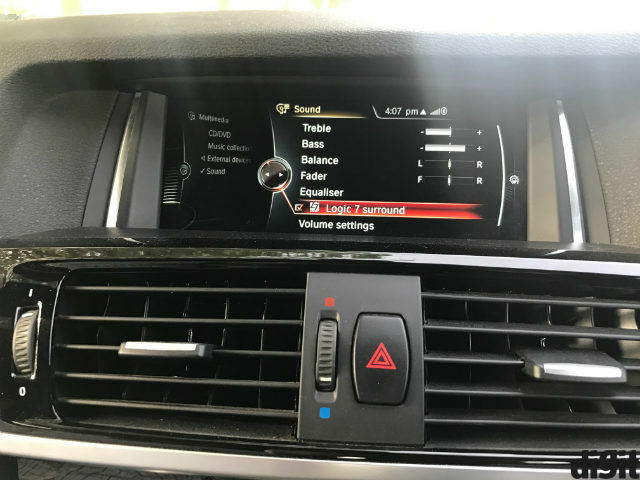 Settings within the iDrive system allow you control over instrument cluster’s digital panels, the iDrive panel itself, lights (including exterior LEDs and interior ambient lighting), climate control, audio, telephony, connections and vehicle statistics. The Trip Computer shows mileage data, tyre pressure, oil levels, average speed of travel, time taken, distance covered and more. 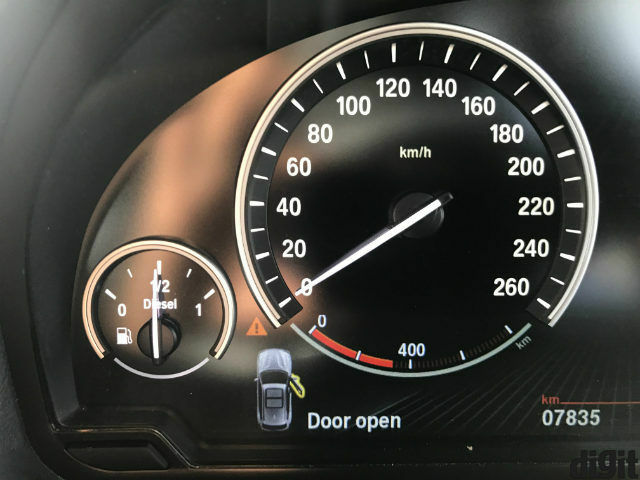 You can also see details about the drive modes from here, which involve Eco, Comfort, Sport and Sport+, depending on the type of road you are on. Another interesting addition is the power information display, which shows the engine power and torque being presently produced. It may not be of any real need to you, but just adds a touch of enthusiasm to the SUV. 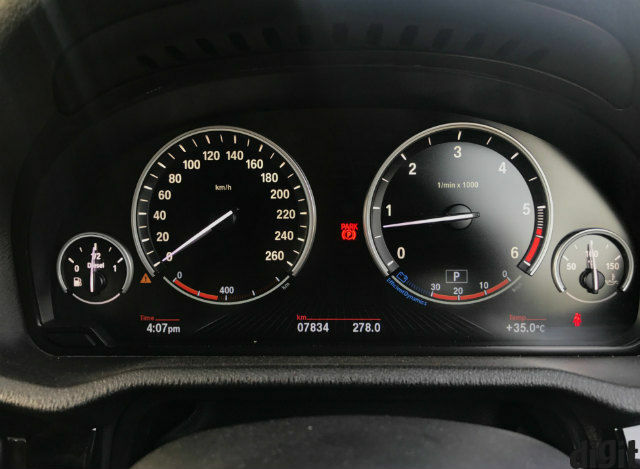 Placed in the bottom half of the instrument cluster, the multifunction display holds a surprising array of information. It would have been easier to see had it been placed slightly higher, and shorter individuals will struggle a little to follow the information being displayed there. Alongside date, time, temperature and trip details, you also get navigation prompts, recently called contacts and numbers, navigation guidance and audio details. You also get text prompts on the status of the car, including liquid levels and any relevant warnings. The HUD is a pretty neat addition here, and makes for a unique addition given that not too many cars include HUDs till date. The HUD adds slight functionality in terms of not having to take your eyes off the road, and the projected data is clearly visible even in bright daylight. One strange error I recurrently encountered is when I tried selecting music tracks to play right after pairing my smartphone, and the system played a different track from the one I chose on the HUD. Selecting a different connectivity mode and switching back to Bluetooth reloaded my playlist, following which everything worked normally. It may be a bug in the software, seeing that it is not really consistent. The HUD here is not really indispensable, but makes driving easier. 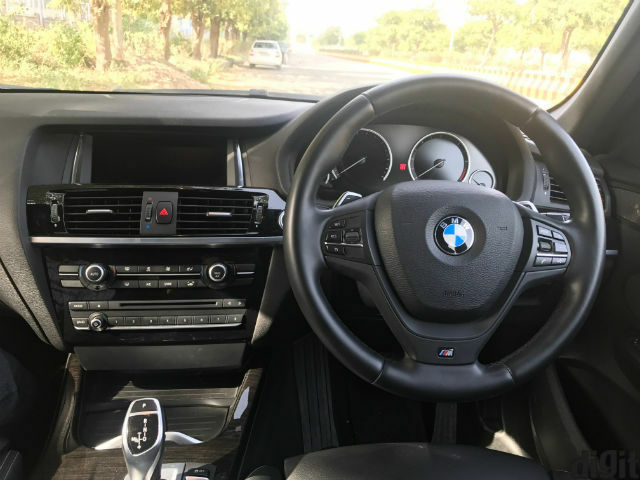 Once you get used to the distribution of buttons and dials on the steering wheel, you will instinctively use the scroll, arrows and mode buttons on the steering wheel to make calls, access latest calls and toggle music. The navigation prompts (direction arrow accompanied with distance to the upcoming turn) suspended in mid-air are also quite helpful, and all of this is topped by the fact that having an HUD in your car is just simply cool! The audio is delivered via a 16-speaker, 600W Harman Kardon surround audio system, which is exclusive to the M Sport edition for the BMW X3. The audio system is loud and has a powerful thump to the audio in terms of its low frequency performance. The Harman Kardon Logic 7 surround system creates a wide soundstage with easily discernible direction of audio output. You can adjust the direction of audio output with the fader, and an added equaliser for frequency bands make tuning the audio to your preference even easier. You would seldom go beyond 50 percent of maximum volume unless you like really loud music. In case you do, and would probably opt for rap/EDM for the most part, the thump of the bass will be right up your alley. If all of that would not be enough for you, there’s also memory seats with two seat configuration storage, dual-zone air conditioning, a panoramic sunroof, auto-dimming mirrors, rear parking camera with sensors and histogram-like proximity alerts, speed limiting function with cruise control, rain sensing wipers, adaptive LED headlamps and illuminated side skirts. 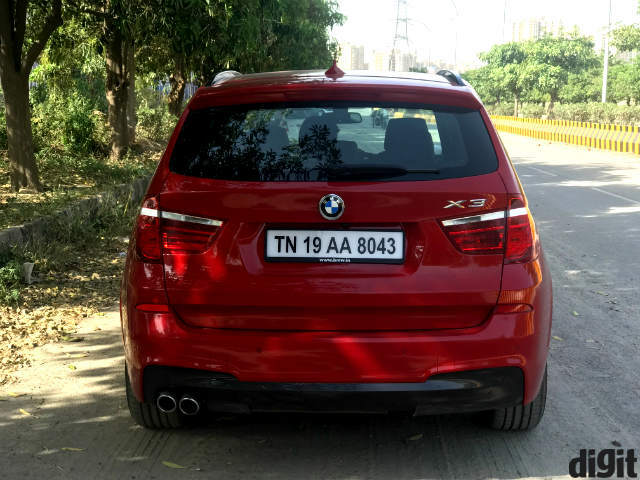 The only notable element that is amiss in the BMW X3 M Sport is a gesture-opening tailgate, and ventilated seats. 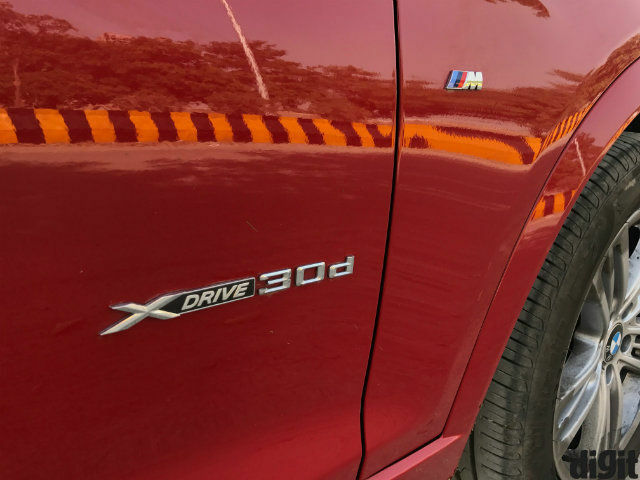 With plenty of assistance and comfort emanating from the technology and electronics inside, the BMW X3 xDrive30d M Sport does not disappoint even as you hit the road. 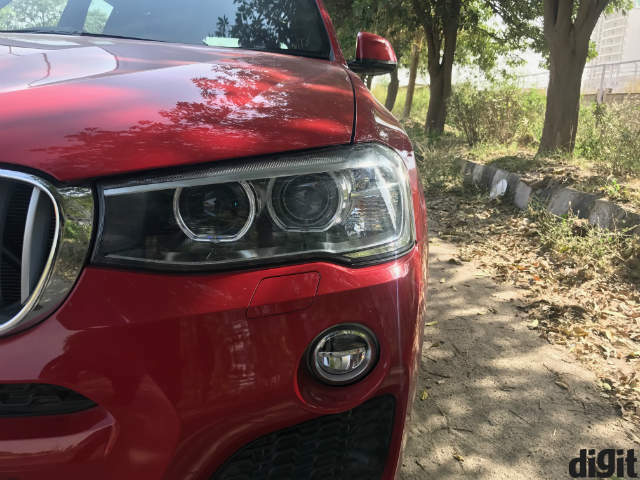 The car is powered by a 3-litre, 6-cylinder inline TwinPower turbocharged diesel engine producing 258 brake horsepower and 560Nm of torque, along with an 8-speed Steptronic ‘Sport’ transmission with shorter gear ratios to give a more throttle-ridden performance. You also get Servotronic traction, braking and stability assistance at all speeds, dynamic power distribution, braking and damper control for more linear power delivery and adapting suspension to the roads, and xDrive 4WD with torque split to add to its off-roading capabilities. You also get automatic start/stop, and brake energy regeneration with BMW’s EfficientDynamics. What all of this means on the road is a powerful highway cruise. There is lag at lower engine revs, but the car catches up as you hit the highway and shift to Sport modes. You get good power on tap as you hit the highway, and you won’t break a sweat to go all the way up to 180 kilometres per hour. Adding to that is a slightly lighter steering wheel than what we had expected, but that does not stop it from still being quite good. The steering is precise, and this being an SUV which more families would opt for, the inclusion of a lighter steering wheel is understandable. We did expect a more enthusiastic one in the M Sport edition, though. Shifting to Sport+ somewhat liberates the engine, and the gear ratios are further shortened to add more response and aggression to the drive. This makes the BMW X3 surprisingly agile, and you forget for a while that this is an SUV that you are driving. The handling of the BMW X3 is easy and fun even in tight corners, but despite all the electronic stability controls and assists, the perceivable body roll in the cabin means you would rather slow down in corners (you must, anyway). What is truly impressive is the well-balanced suspension, which manages to sit hard on the ground and still not get unsettled with sudden road craters. The large bumps are the only ones that you need to watch out for, which, looking at Indian roads, you cannot really help. 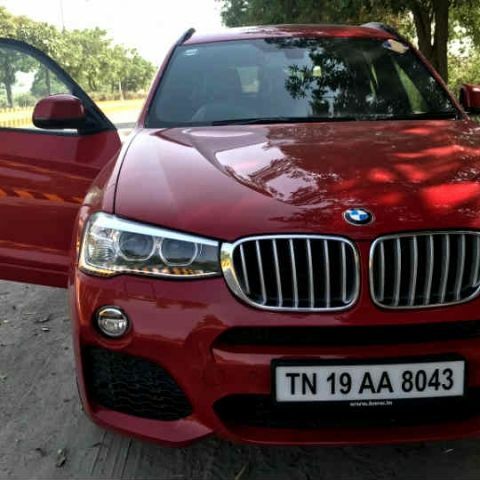 The BMW X3 xDrive30d M Sport is an enthusiast’s SUV. It is for those who need the extra space or simply prefer the aggressive stance and bold designing, and yet do not wish to compromise on the fun behind driving. 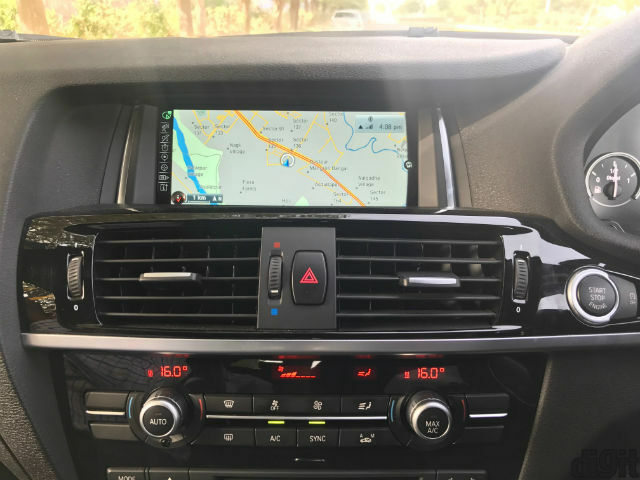 You also get BMW’s trusted iDrive infotainment system with multiple app support and all essential features, every connectivity mode you would need in a car, and an HUD makes it more cutting edge. At Rs. 61,00,000 (ex-showroom Delhi), it is a thoroughly reliable luxury SUV, on which you wouldn’t mind splurging. Nokia latest version of m indicator?